Let Us Offer You a Free Rental Analysis! Please provide your property address in the field below. Call us at (904) 565 9040 if you have any questions. Fully immersive 3D/VR Tours, Videos and Professional Photos will increase your property’s exposure and reduce vacancy days! Unlike other property management companies, we focus exclusively on residential rentals – we are not focused on sales. We are the local property management experts, and we are dedicated to helping you rent and manage your home or condo. Our focus on providing high quality service gives our clients the peace of mind they need when entrusting the management of their home from afar. Our commitment to honesty and transparency has guided us for over 13 years. We don’t do upcharges, plain and simple. Our fees, like our service, are simple and straightforward, making it easy for you to estimate expenses easily. Other Jacksonville property management companies upcharge as much as 20%, with countless hidden property management fees! Beware of discount companies because those small hidden charges (that we don’t charge) can add up quickly. When it comes to renting out your home, don’t leave the fate of your home with amateurs. Our real estate professionals have years of property management experience in Jacksonville and St Augustine. They work closely with you to understand your specific challenges, desires, and deliver solutions through providing premium customer service. We’ve stood strong for over a decade by ensuring success for our home owners, landlords and tenants. We believe in providing you with Property Management with integrity and transparency. Integrity is key in all of our dealings and relationships. We are empathetic to owners needs because we are investors ourselves and understand how hard you've worked to get to this point. 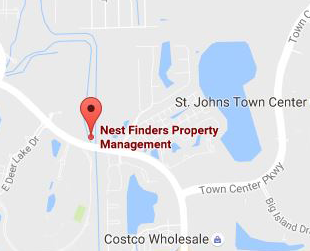 Nest Finders takes care of your business like it's our business! We make sure your rental property gets seen by potential tenants through the right avenues. Our property management marketing strategies extend far beyond the basic “for rent” signs used by our competitors. We utilize every channel available, including video and social media as well as over 40+ websites in marketing. Our expertise in knowing the Greater Jacksonville, and St Augustine FL rental markets, use of extended marketing channels and the relationships we have created in the local community allows us to find great tenants for your rental property quickly, and keep vacancy days low. Property Management Inspections shouldn’t just be about checking boxes. We provide an in-depth analysis of your rental property each and every time we visit. Our Jacksonville rental management company also offers regular property inspections to keep each home in rent-ready condition. Protecting and maintaining your home and your investment is our property managers top priority. We use cutting-edge technology to not only market your rental property but also give you 24/7 account access with complete transparency and real time data. From online statements, repair reports, to cloud based viewable inspection reports and videos, our Jacksonville property management team ensures you are kept up to date about your rental property. Tedious paperwork is a thing of the past, thanks to our streamlined reporting process. This provides our home owners, landlords and tenants’ piece of mind knowing there is clear and fast communication between all parties involved. We constantly strive to improve our service and learn what we can do better for our valued customers. Looking for fresh perspective and diving into the latest technologies and opportunities means that we are always on the cutting edge of the market. Ready to Elevate Your Jacksonville or St Augustine Property Management Strategy?